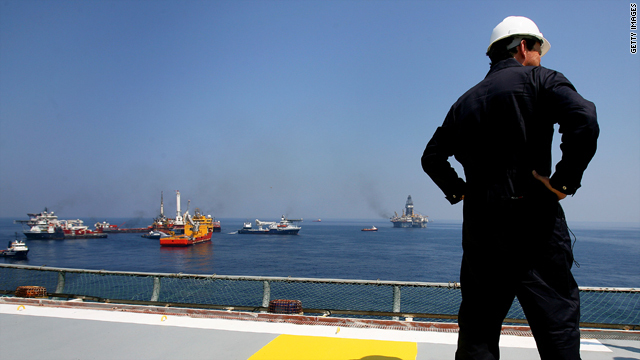 BP CEO Tony Hayward stands on the deck of the helipad of the Discover Enterprise drill ship during recovery operations May 28. Brazile: "Make sure Big Government is big enough to keep Bigger Business in check"
Editor's note: Donna Brazile, a Democratic strategist, is vice chairwoman for voter registration and participation at the Democratic National Committee, a nationally syndicated columnist and an adjunct professor at Georgetown University. She was the campaign manager for the Al Gore-Joe Lieberman ticket in 2000 and wrote "Cooking With Grease." (CNN) -- In 1947, when AT&T was America's only phone company, a woman called the company's chief operator to protest a long-distance charge on her bill. She proved her house had been shuttered when the call was made, but the operator refused to reverse the charge. "This isn't the end of this, you know," she said. The operator replied, "And where will you go?" This week on the Gulf Coast, Interior Secretary Ken Salazar, lashing out at BP's failure to stop "the biggest oil spill in human history," threatened that BP had better produce or "We'll push them out." The unspoken reply was, "And where will you go?" It wasn't BP that contradicted Salazar, but, ironically, Coast Guard Commandant Adm. Thad Allen, who said, "The private sector owns nearly all the means to deal with this problem and [to] fix the leak." Big Government: Meet Even-Bigger Business. The far right likes to invoke Big Government like a bogeyman, a ghost to frighten the uninformed. But when they need Big Government they decry its absence. Bobby Jindal was trying to privatize much of Louisiana's government services. Had his approach been applied nationwide, the Federal government wouldn't have the resources he's demanding it use to save Louisiana's coast. Can government get big and bloated? Of course. But there's a difference between starvation and a diet. What the right fails to acknowledge is that big business, by its nature, is a bully. And you don't stop a bully by turning yourself into a 90 pound weakling. In fact, you may have to gain weight. Regardless, you have to exercise, changing pork to muscle. It's going to take lots of muscle to truly hold BP responsible for the massive impact of its failure. President Obama has already deployed 1,105 vessels to contain the spill, but this massive flotilla is not a match for the estimated 798,000 gallons of oil spewing daily into the Gulf of Mexico. It's going to take lots of muscle to truly hold BP responsible for the massive impact of its failure. Residents of Louisiana and the Gulf Coast are understandably frustrated, but they, and all of us, need to remember who made the mess, and why. Obama's Interior Department released a report that uncovered "a culture of cronyism" between federal regulators and oil and gas executives, a "culture" that dates, unsurprisingly, to the Bush administration. Now let's be clear: This is BP's fault, not Bush's, no matter how complicit in the neglect. Rand Paul, expressing the Right's "business before people" philosophy, dismissed the preventable disaster as a case of "accidents happen." Well, unregulated big business is no accident, though it is a disaster. We know BP failed to follow federal mandates, environmental guidelines, engineering best practices and common sense. Now the Times-Picayune reports that hours before the explosion, BP sent home a team of experts hired to test the well's cement lining -- without letting them perform the test that would have detected the problem. That's what we in Cajun country call greed and arrogance. BP's defiance of an EPA order to cease spraying a toxic dispersent and its attempt to buy out Gulf fishermen for $5,000, is not only offensive, it's downright criminal. The truth is, this is a huge mess, an environmental and personal disaster with no easy answers. Will the "sand islands" sop up the oil? Maybe, but at what cost elsewhere? How long before the seafood and wildlife nurseries recover? Who knows? Seventeen years after Exxon Valdez, Alaska's herring still aren't back, and that spill was a fraction of the size. What will be the impact on the lives and lifestyle of the Gulf fishers, and those whose livelihoods depend on them? Guess, and guess again. Will the flood of oil erode the marshes and wetlands so far that the next hurricane makes landfall in Indianapolis? Next time you hear the Big Government vs. Bigger Business stereotype, remember who's cleaning up after whom. An Obama House Cleaning is ahead. And the bullies will be punished -- not just fines, but jail time is in order. President Obama needs to do more than clean the regulatory house and discipline Big Oil. He needs to institute preventive and compensatory measures: Prioritize the wetland and levee repair that should have come after Katrina; expedite the oil and gas revenue sharing -- Louisiana can't wait seven years; help the victims regain their livelihood. Give us daily briefings, President Obama, of what's been done, what executive orders have been issued and what legislation is being passed. In short, make sure Big Government is big enough to keep Bigger Business in check. Or who knows what price we'll pay.